Judging by a "Save The Date" teaser revealed today by Evan Blass (known on Twitter and among tech enthusiasts as @evleaks), the LG V30 will be officially announced on August 31 in Berlin – almost certainly during a pre-IFA 2017 event. This is in line with a previous rumor, and means that the V30 will arrive almost one year after its predecessor, the V20 (announced on September 6, 2016). The teaser to LG's upcoming event – seen on the left – doesn't reveal much, but it shows a V, and the silhouette of the new smartphone. 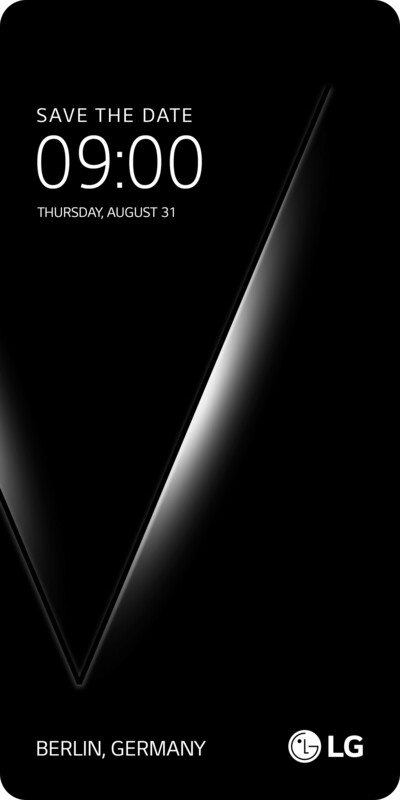 The name V30 isn't mentioned anywhere, but we'll be shocked if LG doesn't use this moniker. Unlike the V20 and V10, the LG V30 likely doesn't feature a secondary display. Instead, as seen in these renders, the handset supposedly sports a single large (around 6 inches), near-bezel-less display à la LG G6. Interestingly, this could be an OLED screen. The new smartphone should also offer a dual rear camera, a fingerprint scanner on the back, a USB Type-C port, and a 3.5mm headset jack. We'll be here to bring you more details about the LG V30 as soon as we have them. V20, legendary audio quality. SUPERB! I'm actually rooting for the pixel xl 2 and nokia 9 this year, but boy, i certainly do hope that lg brings it this year tbh. All the best lg. Lost a little bit of interest on LG since bootloop disabled my V10 days ago. But I am curious... Y'all sure those letters at the chin doesn't come from a secondary screen as shown by previous renders? I really liked V20 so much. Wish them luck, hopefully it won't be full of mess. Yeah should be interesting to see what LG bring to the table this year with the V30, I'm really curious to see how good their OLED is, as their tv's are Awesome! I've always admired LG phone's for how snappy they are, as it's quite near to stock android. But I thought the secondary display was the main selling point of the V series? Come on LG why ditch this unique feature? Next LG Flagship with OLED By LG. Now LG better battery life. I'll upgrade from my G6 if it comes with an OLED display that matches Samsung's and if it gets a big battery. Image makes it seem like aspect ratio will be 2:1. It also makes it look like if they include a sceond screen, it will be at the bottom (where the Berlin and LG logo are) possibly for the home/back/options buttons. I'm picturing just a bigger version of the G6 (hopefully all-out specs). It would also be nice to have the volume and power buttons on the back like the earlier G# and v## series phones too.